The brush border between what is and what is not a Tribute Act appears to be becoming less and less defined with each passing year I feel. The current incarnation of Fleetwood Mac for example, although containing only two original band members (and arguably the two least creative ones, I might add) are clearly not a Tribute Act. Whilst I would suggest the four individuals who presently perform under the name Dr Feelgood most certainly are. Things get rather muddier away from these extremes. Nazareth and Wishbone Ash, both of whom can be found out and about this summer, each boast just one foundling in their respective line-ups. Even a long running behemoth like Yes, are knocking on the Tribute Act door. Chris Squire’s sad demise mean the band will be touring this summer with no original members. It makes me wonder if in a hundred year's time, musicians will still be touring under the banner Yes. As long as folks wish to hear the music, why should it not be performed? Which brings us I suppose to this evening’s conglomeration. Woody Woodmansey, as I am sure most of us folks of certain vintage will know, was a Spider From Mars. In 1970 he was invited down to London by fellow Hullensian Mick Ronson to help record what would become David Bowie’s The Man Who Sold The World album. What was intended to be just a few weeks’ jaunt turned into a three-year rollercoaster, with Woodmansey playing drums on Bowie's three subsequent albums, as DB morphed from a one-hit-wonder folkie into full-blown Rock Star. It all came tumbling down on July 3rd 1973 when Woodmansey, along with bassist Trevor Bolder was ritually sacrificed to allow Bowie his headline-grabbing “Last show that we'll ever do” announcement at the Hammersmith Odeon. Out on his ear, he began to pay his mortgage by taking part in an ill-advised Spider From Mars project, before briefly tagging onto the burgeoning new-wave scene with the surprisingly poppy Woody Woodmansey’s U-Boat, (who I saw perform, by coincidence also in Glasgow, some 38 years ago). But when this venture sunk without trace (ha ha), the man settled down to a low profile career as a session man and drumming tutor. In 2013 he decided to get together with a bunch of like-minded musos to perform David Bowie songs from the period 1969-73. In 2014 American producer Tony Visconti who had played bass guitar on and also produced that TMWSTW came on board, and the band decided to tour playing the whole of that album. Steve Norman, Marc Almond, Glen Matlock and Glenn Gregory all pitched in on that initial tour, although only the last-named was performing this evening. 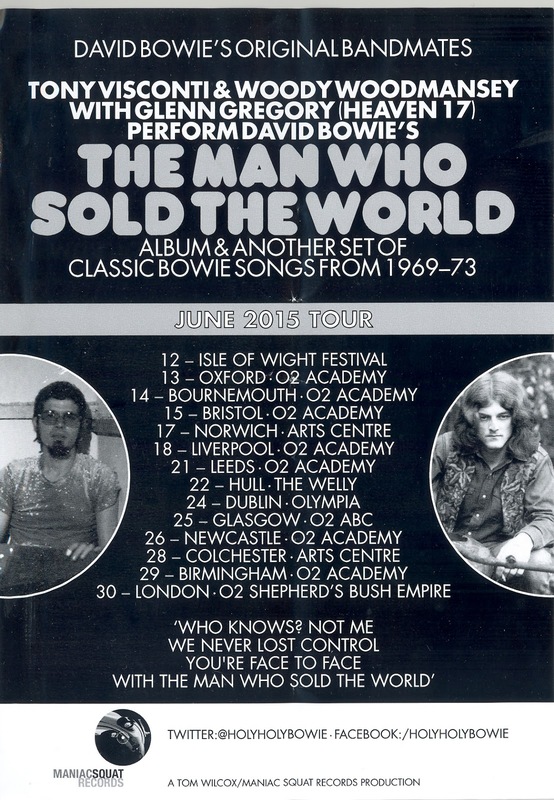 Well, as the blurb clearly predicted: Tony Visconti & Woody Woodmansey with Glenn Gregory did indeed perform David Bowie's The Man Who sold The World. Woody thumped along in his inimitable manner, Visconti effortlessly recreated that farting (farting used here in a good sense) bass sound which appeared to disappear from rock music around 1971, and the two electric guitarists between did a believable impression of most of Mick Ronson’s original parts. I had never really thought Glenn Gregory to own much of a vocal range, and felt his baritone may be more suited to covering Thin White Duke era Bowie, but he really was rather impressive this evening. He perhaps didn’t bring quite bring the same sense of weary resignation to All The Madmen Bowie had, but otherwise he did as good a job as anyone who was not actually David Bowie could probably have achieved with this classic material. “Are you all having fun?” he asked us, at one point. After the predicable response, he stated, ”Well just think how much fun I am having”. And he certainly looked to be – clearly utterly delighted to be performing these songs he (like most of the room) grew up with. Not all the band’s renditions hit the mark though: The ethereal dream-like waltz of After All was spoiled a touch by Woody thumping his bass drum pedal throughout, and during the show opener The Width of a Circle there did appear to be a short period where multi-tracked acoustic guitar was clearly audible, without any of the guitarists on stage actually doing any strumming. Very suspicious. But the real disappointment was they did to She Shook Me Cold. On the album this song, a tale of a Don Juan getting his sexual comeuppance, was naught really but a vehicle for Ronson to perform a particularly fine Hendrix impersonation and I suppose what I wanted was to hear was the solo played note for note. But the guitarist tonight did not even attempt it, rather settling for a lazy feedback blow-out. “Now, that is how to do it!” Gregory glowed afterwards. “No, it is not" I replied inwardly. But the title track was reassuringly eerie and The Superman suitably epic, even having a welcome reprise tagged on. The real delight was Black Country Rock which, well, just rocked. I always felt this track to sound like a piece of written-during-a-fag-break filler, but the rendition this evening was top notch. For the remainder of the gig (there was no interval) we enjoyed a selection of other Bowie tunes from the early seventies. And I have to say I did feel we began drifting more towards the Tribute Act shoreline. Tony Visconti had had no part in creating any of these songs originally, with the exception of Wild Eyed Boy from Freecloud from Space Oddity. The opening three tunes from the Ziggy Stardust album opened this section, allowing Woody to perform his trademark Five Years drum beat. One of the guitarists made a reasonable fist of the guitar solo on Moonage Daydream, but it dawned upon me at this point that who I would really have loved to have been witnessing on stage was not The Dame, but the late Mick Ronson. Whom, to my eternal regret, I never saw perform. His daughter Lisa was here though, as one of the three backing singers, and she enjoyed a solo turn serving up an impressive rendition of Lady Stardust before – what really was the high point of the evening - a raucous duet with Gregory on Watch That Man. She really could shimmy and stroll like a Chicago moll. Then, once the keyboard player finally got to grips with Rick Wakeman's piano part, Gregory led us through a remarkable performance of Life on Mars. A few songs later, Rock ‘n’ Roll Suicide reassuringly wound the main set down to a conclusion. For the encores of Time and Suffragette City – two songs I have never had much time for – I moved to the rear of the hall to attempt (I failed) to get a decent full-band pic, and only then did I realise just how much the venue had filled up. And the place was jumping - although the clown in front of me who kept bellowing to hear Uncle Arthur, was clearly going to end up disappointed. At the conclusion of the show Woody was dragged to the front to say a few words, and was mostly drowned out by a spontaneous terracing chant of “Woody, Woody, Woody!” He looked genuinely lost for words at the acclaim, and for a brief moment, I thought he was going to burst into tears. Tribute Act or no Tribute Act, I think most folks inside the O2 ABC were here to pay tribute to just one man: Woody Woodmansey. I just love it when the musicians I go to see have even less hair than I do. Good write up, and good pictures again. I think with hindsight I probably could have chosen a better example than Dr F. - perhaps The Drifters who just appear to go on and on and on with ever younger replacements.